Is something that starts with the word “half” a worthy challenge for my bucket list? Eight weeks before the half marathon I went out for a morning jog and came home on crutches. Somewhere between Katy Perry and Justin Timberlake (circa 2007) I missed a large chunk of coconut on the sidewalk, tripped over it and a loud pop interrupted my up-beat Pandora radio station. Crying in pain, I fell into the grass gripping my ankle. Fortunately there’s a lot of foot traffic in my neighborhood at that hour, and within a minute a guy on roller blades with his dog leaned over me. Danny came with the car and away we went to the hospital for X-Rays. In and out in half an hour, I hobbled to work with a temporary cast and crutches. Six-eight week recovery the physician said. See an orthopedist next week he suggested. A sprained ankle humbled my first half-marathon training. So much so that prior to the race I had only done 4 miles since the incident with the coconut. I played down expectations as much as I could in the final two weeks. I probably won’t even finish I told my coworkers, secretly hoping that I would, but knowing full well that it was unlikely given that running still required a brace and a significant amount of pain killers. The morning of the race we left the apartment before dawn, piling into my aunt’s van we cruised Chicago’s Lake Shore Drive dancing in the car to Michael Jackson. By the start I was relaxed. I’ll see you guys at the finish I told everyone, encouraging them to run their own race. Ever the gentleman, my cousin Julie’s husband stayed with me for the first two miles until I stopped to walk and shake him. I didn’t want to be embarrassed if I needed to stop the race. My tempo was upbeat and before I knew it I was passing mile marker seven. I was in shock for deep down I truly didn’t think I’d make it. Light footed up an exit ramp to an overpass, I passed another first timer with tears streaming down her face. With encouraging words and a pat on the back, I emotionally pushed her up to the overpass and down to the first aid station. Mile markers 8, 9, and 10 passed uneventfully and I realized I was going to make it. Even if I stopped to walk, I was going to make it. That realization passed with a deep sense of accomplishment, pride and peace. It’s a strange feeling to realize before you actually complete a task that you are, no matter what, going to achieve your goal. Personally, the realization that not only was I going to finish, but that my time was going to be respectable was incredibly emotional. For nearly a decade I’ve suffered from chronic stress fractures in my shins. Despire any number of medical and physiological treatments, my shins require constant care and attention. They have held me back in the past and for a long time I’ve been fearful about doing significant distance on them. For me running a half marathon was more than just covering 13 miles. My shins have held me back time and time again in the last 10 years, running the half marathon was the first time since being diagnosed that I didn’t feel their burden. At the end, it wasn’t easy. Un-lady like thoughts buzzed through my head through mile 12, which was marked every .25 of a mile. Each quarter of a mile felt like an eternity and when I finally saw the finish line I was ecstatic. Without much fanfare (the cheering section was lost in the crowd!) I crossed into the welcome arms of a volunteer who held out water and a banana. Regaining my composure I quickly posed for a victory picture, and then another and another and another before getting out of the runners coral. This was a very personal accomplishment for me, and one I’m very proud to cross off my bucket list. I’m not sure what’s next off the list. Perhaps something fun like skydiving? Photo courtesy of Flickr user Toomas Hinnosaar. Growing up I was never particularly athletic but at some point, something changed, and I became a runner. I’ve now run three marathons and have logged thousands of miles. The weird thing is….I don’t much care for distance running; it generally hurts, takes up a lot of time, and makes my clothes smell. Lately I’ve gotten back into running but only for short distances, usually 5-10 kilometers (3-6mi) at a time. I enjoy exercising, but going out and running non-stop for 2 hours excites me about as much as a dental appointment…just because I do it, doesn’t make it fun. Before this weekend, the furthest I’ve run in the past 3 years was approximately 8 miles. A far cry from those 26.2 mile marathons I used to race. 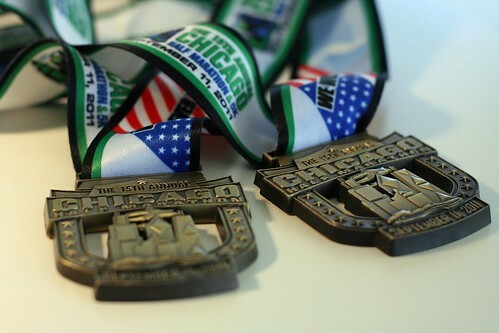 This past weekend Jillian and I traveled to Chicago to run the Chicago Half Marathon. The race was 13.1 miles along the lake shore and mostly skipped the sites of Chicago that most tourists would be interested in seeing. The run was almost completely flat and didn’t provide for a large amount of spectators. Other than running the same race as Olympic speed skater Apolo Ohno, and the Chicago deep dish pizza provided at the finish line, it was amongst the least exciting races in which I’ve ever taken part. But it was probably my favorite. This time I didn’t train hard and I really didn’t know how quick I’d do the run. I was at the start line with four other family members who were mostly in the same boat as me. Jillian’s sister, Becka, helped pace me for most of the race, but after that I was on my own. But at the start I was with people. At the finish I found all those fellow runners again. My five AM wakeup call was a team effort and the night before had the feeling of a couch-surf mixed with a chocolate-fueled teenage slumber party. Pre-race we joked about laxatives and how poorly we’d do rather than race splits and pace groups. Post race we all enjoyed bagels and football together and when I was restless it wasn’t too difficult to convince others to join me and the big dog Hendrix for a walk along the lake. 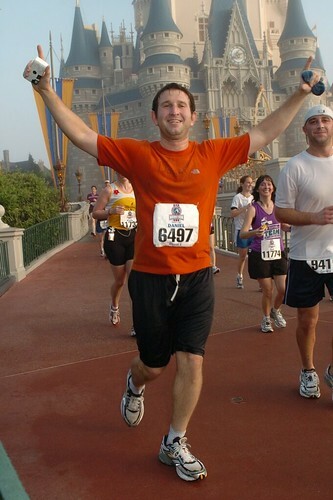 This race was my favorite because for the first time it was vacation first, race second. If it hadn’t been for the race I think most of us wouldn’t have been traveling this weekend, somehow though the race brought us together and it was worth the trip all the way around. On the pavement, I pushed harder than I ever had in the past, but once I finished it was time to relax and enjoy the pizza! I don’t expect I’ll ever again train for a big race again but because of this weekend I do expect to sign up for far more of them. And if anyone is curious, I ran the 13.1 miles in 2 hours and 6 minutes. That’s means each mile took me, on average, about 9 minutes and 40 seconds. I didn’t train particularly well. My first marathon, exactly twice the distance I ran this Sunday, for which I trained 6 months to run, saw me finish in an even 5 hours…you do the math! The emotions of reaching a finish line for any event are complex. For me it’s usually some combination of relief, excitement, exhaustion and relief (did I mention that one already?). We regularly compete in athletic events, not to win, just for the personal satisfaction. We couldn’t let old habits die so when our CS hosts in Johannesburg invited us to join them for the Midmar Mile in South Africa– it’s the worlds largest open water swim- we couldn’t resist. Swimming a mile takes a lot longer than running a mile and for most weekend athlete’s, is a considerable distance. Danny is never one to shy away from an athletic challenge and as we started to look at competing in triathlons he worked hard to improve his swimming skills. Fortunately all that hard work paid off and he completed the race not only exhausted but with a huge smile. We engraved our metals and while mine says my name and time, Danny’s simply says “not last.” It’s that optimistic attitude that I love about him. IF YOU GO: We were lucky to swim our first Midmar Mile with friends who had competed in the event several times before. Logistics are obviously messy at the event, that’s what happens when 20,000 people covered in only bathing suits are running around. It was a great event though and we enjoyed every part of it (especially the finish line!). After big events I’m always exhausted though, so make sure you don’t schedule a flight or something for the evening after an event. Do something relaxing instead, like sleep or better yet go on a Jamaica holiday the following week in celebration of the finish line! You may ask yourself, what does this passport have anything to do with bicycling (remember all our photos this week are themed bicycling for bike to work week!)? This is actually a photo from the 2010 Tour de France. We caught the first days of the Tour near Brussels. Admittedly we were star struck hanging out by the team buses. If I can use the term cycling groupies, that’s what it felt like. A small crushing crowd surged towards the barriers as the cyclists emerged from their team bus to check their bikes and prepare for their race. A few of the cyclists came over to great the crowd and the guy next to me shoved out his passport for an autograph. We all laughed as the cyclist (I can’t remember who it was anymore) asked if it was even legal to sign a passport. Who knows, but hopefully the fan got back into the US without a problem. We traveled Europe quickly, covering a lot of ground in just a few weeks. 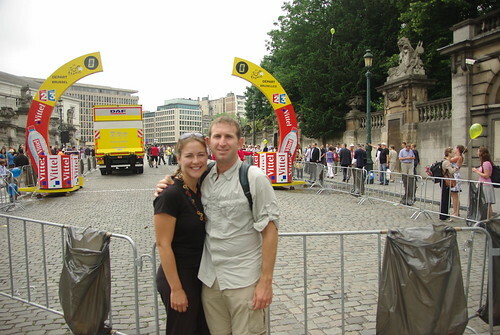 Our main objectives were the Tour de France and the running of the bulls (San Fermin) in Pamplona, otherwise we traveled without a set schedule, stopping into see couchsurfing friends along the way. We had a blast despite the fact that our timing as all last minute. What have been your favorite last minute holidays? As I sit here now, watching the final stages of the 2010 Tour de France, it is incredible to think of all that has happened on this year’s tour. The first few stages were a train wreck of crashes and disasters, those were some of the ones we were able to see while we were in Belgium. 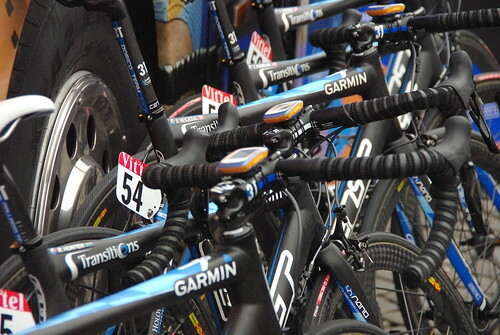 The team I cheer for, Garmin, lost its lead rider almost immediately. Another race favorite lost the yellow jersey (that’s first place) when the wrist he broke the day prior, and kept secret from the rest of the racers, got the best of him. Since that point, it has been a two man race and after all 2,200 miles 90+ hours of racing the second place man will finish a mere 39 seconds behind the overall winner. Lance Armstrong, fell back after a series of crashes early on, finished in 23rd place, 39 minutes behind the winner. If you think bicycle racing is for wimps, I dare you to pedal your bike up a mountain, get to the top, start to roll down at 40mph, and jump off your bike…..not going to do it, are you? So how does it work. It is simple really. The rider who has the shortest overall time wears the yellow jersey each day, making him a target for all other riders. 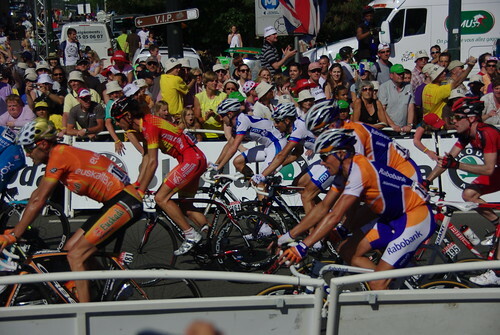 At the start of the race, that first place jersey often changes hands each day of the race as different riders are able to showcase their strengths at different points. Once the race reaches the mountains though, usually the strong climbers take over and the competition narrows to a handful of riders. In addition to wining the overall race, you can also win points for certain climbs and sprints and these points also factor into the competition for other jerseys. Sprinters will compete for the green jersey (mostly during flat stages) for being the best sprinter or the dotted jersey for the best climber. Lance may not have won, but his team took first place in the team category this year and that certainly counts for something. This year we managed to arrange our travel so that we could see a couple of stages. There are no tickets sold to watch the tour and by some estimates it is the most watched athletic event (probably not counting television viewers) in the world. 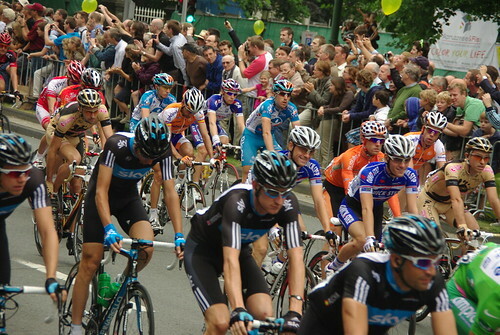 Images on television of spectators on the Tour usually involve people dressed as comic book characters chasing after riders as they pedal uphill. We saw the tour arrive in Brussels on its first day and depart on its second, enjoying the array of crazy advertisements, festival like atmosphere, and barriers separating us from the main raceway…so unfortunately I did not get to dress up like Superman and run alongside the riders. The reason I love the tour is that it is probably the most dramatic, and most athletic event on television. As a former (and future….) endurance athlete I have extreme respect for any man who can sit on a bike seat 4-5 hours a day for over 3 weeks as while crisscrossing two mountain ranges, several international borders, and around flamboyant and annoying spectators clogging the roadways. The equivalent in other sports simply does not exist. Lebron’s athleticism simply doesn’t come close to Lance’s, sorry. It is a true test of physical limits as riders who can’t keep up, begin to fall back and out of the winner’s circle. This is the world’s greatest endurance event and watching as human limits are tested, each day, on live international television, is what brings me back each year.